can one create an image of the hard disk that windows is running at the moment? I have a disk with 3 partitions and two of the three partitions have a different OS to boot with (Windows 7 and Windows 8). So the image of this disk will have the 3 partitions on it ? You can backup a partition or a full disk. Ideally you should make your (system) backup offline (i.e from a winpe for instance). Nethertheless, you could use MS volume shadows to perform an online (system) logical drive backup. If you give me the registry keys and a brief description of what it to be achieved, I can have a look. Sorry erwan.l, but I do not have the knowledge for that. What I can tell you is that OfflineSysPrep is the tool that I used most of the times for this task. Here is a LiveXP Script. Here at reboot.pro we have a thread too. 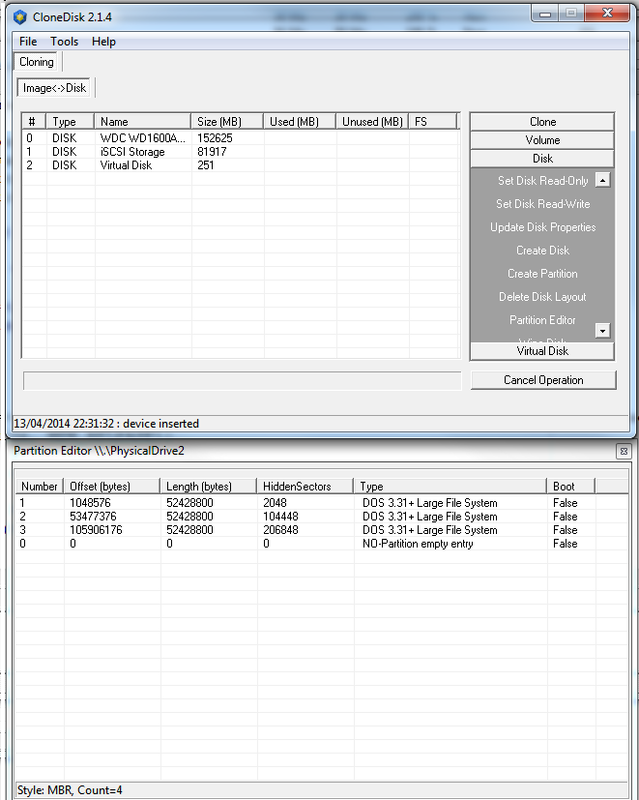 Disk2vhd from Sysinternals has also a similar feature, which changes HAL to match VirtualPC. OfflineSysPrep does a convenient HAL auto detection, matching destination system. So, to successfully boot a restored image that is hardware independent we have to auto detect HAL and disk (SATA) controller, and change them on the offline registry. Edited by David Lynch, 28 March 2014 - 05:54 PM. These files can be found in the offline image in driver.cab or sp2.cab under \WINDOWS\Driver Cache\i386. if it is all about replacing files (and probably update a reg key) in the offline image then I guess I could add this feature to CloneDisk. For now, what I have done is the ability to check the HAL and Processor on the host where CloneDisk is running (can be useful when executed from a WinPE) and also against on offline image/registry. Can CloneDisk change the volume serial number? You mean the volume / logical disk serial number that is to be found in the boot sector? Actualy, for some time I have been thinking about a boot sector editor so indeed I might add this feature in CloneDisk. A word of warning (in passing by). Yes, sometimes we really need to change this serial. 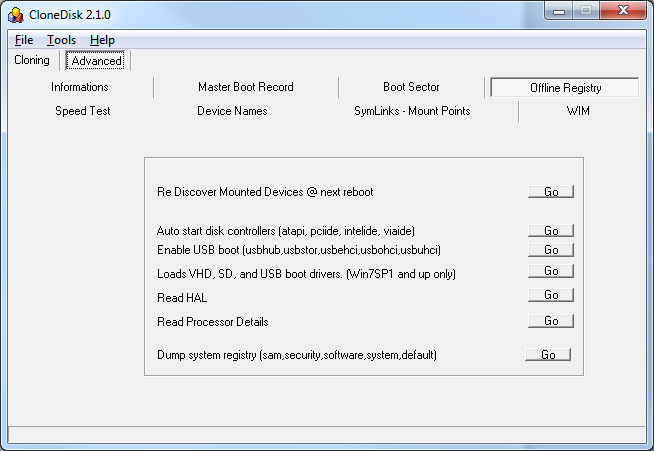 Latest CloneDisk version (2.1.2) can now patch the serial number within the bootsector for NTFS/FAT32/FAT. Regarding NTFS, the serial number is stored in 8 bytes whereas the system seems to use only the first 4. See post from Wonko here. CloneDisk will therefore only read and write the 4 bytes as well. Double click in the serial number boot sector field to modify it. The serial number change is seen by the system only after a reboot or after the volume has been remounted. Wonko disapproves of this . The general idea should be of having more (or better) features than existing programs. Sysinternals VolumeID can already change the serial (but only partially. i.e. the "last" 4 bytes). IMHO at least as an option Clonedisk should allow to change the "full" serial. It is interesting to note how the (3rd and 4th) and (6th and 7th) bytes repeat here! Do you have a Serial Number where these two sets of bytes are not the same? is unknown, it is a pattern consistently found in NTFS bootsectors, and I personally would like to have it happen also on the "new" serial, possibly as a further option. OT, but not much, and JFYI, the way the NTFS serial is generated (and more generally how NT based systems, also on other filesystems do that) is one of the fields that were never explored fully, whilst the DOS way to generate the "random" serial was based on date/time. As indeed this "full vs half" serial number is puzzling me. It seems that all tools outhere (volumeid.exe for example) change only 4 bytes whatever the file system is (ntfs/fa32/fat). Hence me mimicking this but I am pretty sure these 8 bytes are not there for nothing in NTFS boot records and this especially when indeed it seems that there is a pattern in the 4 pseudo useless bytes. But it is a fact that windows systems seem to care only about 4 bytes for NTFS (vol.exe reads 4 bytes, always). Give the user a choice for NTFS boot records to patch either 4 or 8 bytes? Done : each time you will double click in the serial number to change it, the inputbox will propose a random 4 bytes number. I needed a simple partition editor in WINPE environement where I did not have the MMC. fixed : create unique partition was not wiping partitions above 1st partition. Wow!!! 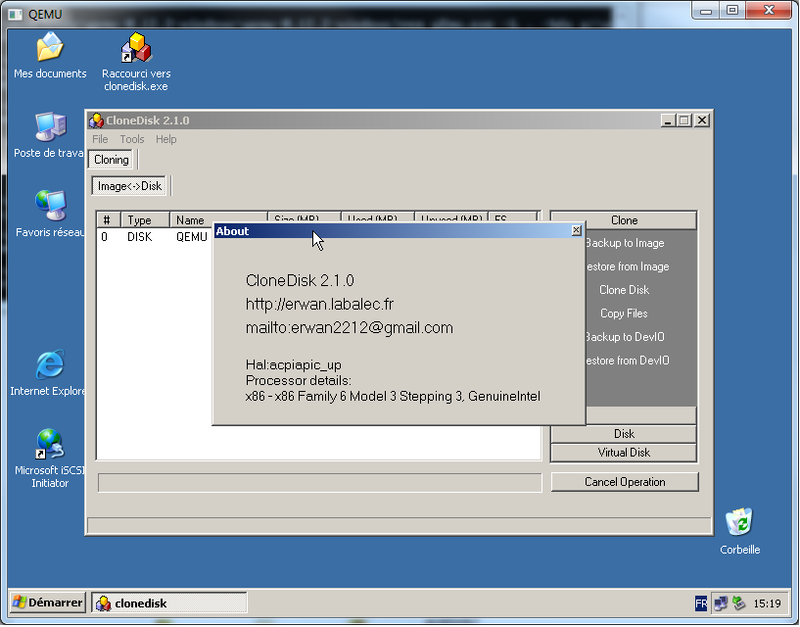 I have barely scratched the surface and I'm already impressed with Clonedisk. I did a quick test this morning in WinFE (based on WinPE 5.0) with a SANPolicy value set as 4 and NoAutoMount enabled. Copyright (C) 1999-2013 Microsoft Corporation. DiskPart failed to clear disk attributes. I had to assign drive letters manually afterwards. Also noted that running this command may have also cleared the readonly flag on a different disk - I'll verify this later as I'm about to start work. It's worth noting that (IMNSHO) Clonedisk is intuitive to use and the UI does not appear overly cluttered with features. I look forward to playing around with it - fantastic work! Just noticed that the about button refers to the new version as 2.1.3. Also changelog needs updating. I'll take care of the about box and changelog. I have looked a bit at the thingy. to convert the "F6 floppy" Mass storage driver .INF to a .REG and then merge this .REG to the "offline" Registry. This converter - though not the easiest to use and seemingly completely UNlike documented - creates from the .INF file not only the "normal" driver entries but also the CDDB (Critical Devices DataBase) ones. to be able to parse a .REG file or create a converter from .REG to offline Registry tool commands. Can you test the above approach on *something* on which DriverInjectionGUI fails?